The Simple Year 3 – Kindness, Caring & Making a Difference One Day at a Time! My name is Kim and I am so excited to be the third guest blogger for The Simple Year! I’ll admit I submitted my proposal to Kerry and Kandice as a bit of a lark (I was hopeful but never confident) and was BEYOND THRILLED to be chosen as this years guest blogger. Before I get into my plan for the next 365 days, I’d like to take a minute to tell you a little about my family. My husband and I both grew up in a small town outside of Syracuse, New York. Although we went to school together from 6th grade on, we did not become friends until senior year of high school. I thought he was kinda cute (and always available to loan me lunch money so prosperous as well) and in the tried and true fashion of high school communications (prior to Email, Text, Tweets and Instagram) I simply asked the girl who had a locker next to his if he was going to the prom with anyone. Well, one thing led to another and here we are – 22 years later – happily married with two kiddos, a beagle and a house in the suburbs of Colorado Springs, CO. 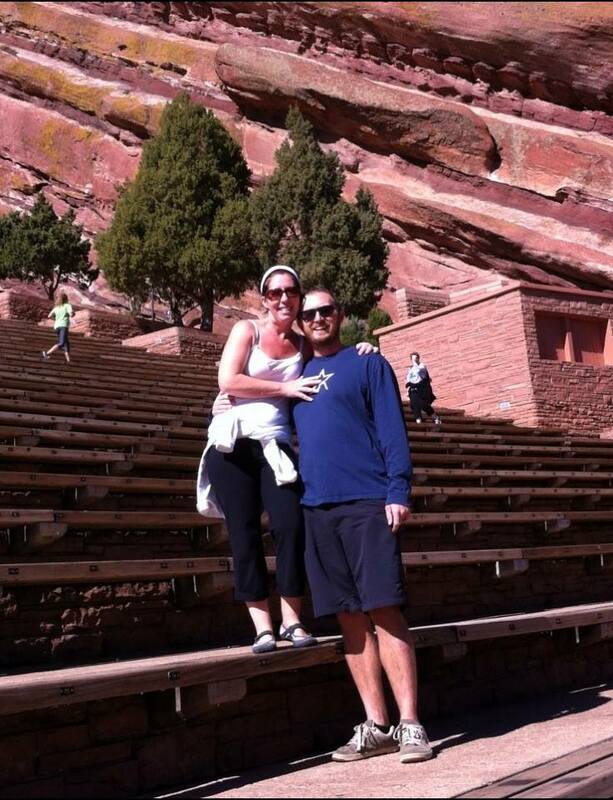 Hubs & I Enjoying Red Rocks! The kiddos! Well – they are pretty awesome if I do say so myself! Our son Hayden is 10 and has a passion for swimming which he’s been doing competitively since he was 6. Our daughter Harlyn is 5 and, what we’ve fondly dubbed, a tomboy princess. She loves to climb trees and ride her bike while decked out in the latest and greatest fashions. 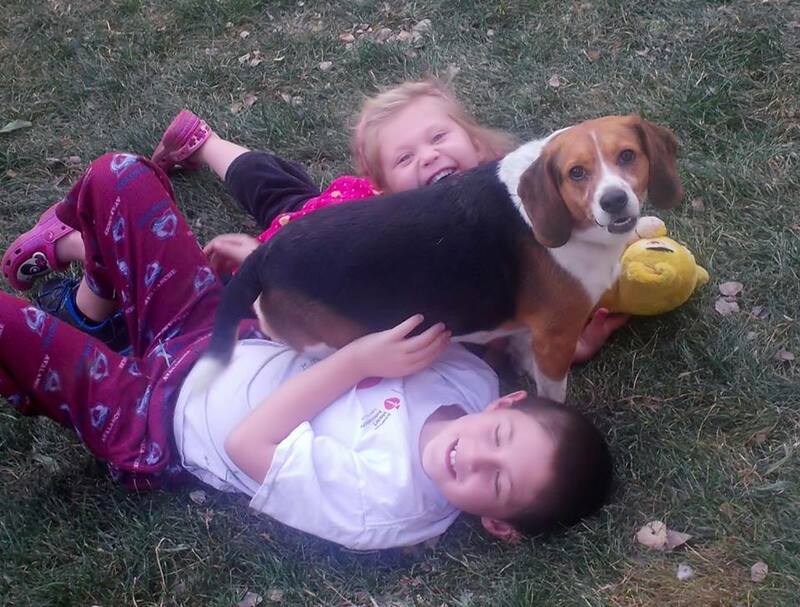 Our third family member is Bella, our own personal Snoopy. Bella loves to take walks, bark at squirrels and is my “work at home” companion – keeping me company while the kids are at school and hubs at work. Now – on to the good stuff! My idea for this years blog is a bit different. While Kerry and Kandice were focused on how to simplify life through the minimization of material possessions, I plan to focus the next 365 days on building connections, bringing people together and improving life (mine and those around me) through acts of kindness. I was inspired to go down this path because of a recent incident in our neighborhood. A young man, only 14, committed suicide at our local park. We are a close knit community and the park is a central place where families gather to play, picnic and generally enjoy the beauty of Colorado. The suicide was like a big, black blight that I couldn’t look away from. It moved me deeply though I did not know the family or the young man. I wanted to help – but didn’t know what I could do to make a difference. I was just one person and not even intimately connected with the family. I felt a heart call but did not know how I would, or could, answer it. The day after the suicide, I was driving home from dropping my daughter at daycare when I happened to see a woman walking down the sidewalk, wrapped in a blanket. There were tears running down her face and the sadness coming off her was palpable. At that moment, I knew this was THE MOM, and that I HAD to talk to her. I stopped and spoke with her for 45 minutes. I mostly listened and tried to carry away some of her pain. I was deeply moved by the experience and wrote a blog post about it – which I posted on the Facebook page our neighborhood had set up for the family. Immediately, I began to get comments. People were moved and shared the post with their friends and family. Out of towners wanted to help, give money and support the family. A Mom in NY wrote to tell me that because of the blog post, she had a long conversation with her son about suicide. At that point, I began to realize there was power in kindness – particularly what I’ve dubbed “conscious kindness” – which is really paying attention in the moment and stepping outside your comfort zone to take action. For the next 365, please join me as I strive to live a life of kindness. This means practicing both conscious and unconscious kindness, encouraging others to do the same, and ultimately recording what happens when you shift focus towards living a life dedicated to compassion, caring and love. If you feel moved and would like to participate, please feel free to come along with me on this journey! If one person can make a difference, just think of all we can accomplish together. I can’t wait to share the next 365 days with you! This entry was posted in Uncategorized and tagged simple year 3. Bookmark the permalink. 17 Responses to The Simple Year 3 – Kindness, Caring & Making a Difference One Day at a Time! “If you think you are too small to make a difference, try sleeping with a mosquito.” – Dalai Lama 🙂 I am looking forward to your year!! Sounds like a great year plan to me, Kim…I am anxious to hear all about it. I was so excited to learn about the new theme! I did not expect that your first post would be such a HUGE act of kindness! of living through this and surviving. Thank you and bless you for stopping, listening and caring! I look forward to reading your new blog now more than ever! Love this idea and can’t wait to see what ideas you have. I love this and am excited to read and join in your journey! What a powerful idea Kim, I can’t wait to come along with you this next year…..
And your story about the young boy, I think I will go home and cuddle my two a little extra tonight, and make sure they “have dreams” too…. Welcome Kim. What a wise choice Kerry and kandice made in selecting you. I just finished reading your other blog with the story of the suicide. Truly tragic and at the same time, you are turning that loss into something positive to take forward. I look forward to the next 365 days. Hi Kim! What a wonderful and kind gesture for you to stop to help this grieving woman. Thank you for showing compassion in what sometimes seems to be a harsh world. Love your ideas for your continuation of the blog and will look forward to reading more about you and your family (and, of course, Miss Bella). Welcome Kim. I am looking forward to your blog and to adding many acts of kindness into my next 365 days. First of all welcome! I have been a faithful follower of the first two years, and now am really looking forward to the third year. But not only do I want to read about your journey, I want to actively participate as well. What a wonderful mission and an inspiration for us all to live in kindness. Again, Welcome!! Welcome! Thankyou for what you are doing. Thank you for the kindness you showed this devastated mom. Having recently moved from that area, and having lost my brother to suicide years ago, this obviously hits close. Can you only imagine how our loving God must hurt? He cares. Give him a chance. I wish you the best & look forward to hearing about your simple year. Take care. I’m all in! In a world that is connected in so many ways, it is so surprising how “disconnected” to one another we really are! Just reading comments from a local reporting site after a 19 year old made a horrible mistake in driving which cost him his life, you would think that we lived in a heartless, compassion-deficit world. I know better than that. Too often, I know if feel uncomfortable extending a kind word for it might seem as though I was intruding. I love this new direction for this blog and look forward to following your journey. I will share one thing I have been feeling called to do….write one letter per day to someone, anyone, even if it is a short note card just saying hello. We have lost this bit of our world and I want to preserve it just a little longer if I can. Remember how we used to pass notes in school? Those days are gone…but maybe, just maybe not. Looking forward to following your journey! I am so looking forward to reading about your journey! When simplifying our lives our minds tend to immediately, and only, think of stuff but this will go to the next level. Btw, I’m not seeing any comments. Is there something on my end I need to do to be able to read comments?